During his senior year at the Illinois College of Optometry in Chicago, Dr. Jim Hess had his eyes opened to the need for eye care in the poorest regions of the globe. Through VOSH (Volunteer Optometric Services for Humanity), Hess took his first trip to Honduras. For a Stearns County native, who had to leave the state for the first time for optometry school, going to the Third World to help others was an eye-opening experience. One trip, said Hess, and he was hooked. Since 1979, Hess has taken 35 trips through VOSH to far-flung places on the globe: to Columbia (four times), Ecuador, Guyana, and Peru in South America; throughout Central America, including repeat visits to several countries; to Anguilla, St. Vincent, and the Dominican Republic in the Caribbean; to India in Asia; to the Ukraine in Europe; and to Kenya and Tanzania (twice) in Africa. His most recent trip, with his wife, Margie, a retired optician, was to Vanuatu in the South Pacific in February, and his next trip is to Romania at the end of April. "Our missions have brought the precious gift of sight to literally hundreds of thousands of people who have either no access to eye care or cannot afford it," said Hess. "Our missions have not only helped these people see but have opened the eyes of mission participants as well. We have seen poverty that is indescribable and been rewarded in ways immeasurable." "Every time I go, I ask myself, 'Why am I doing this?' ' said Hess about his travels. "I still enjoy helping other people; that's #1. But I also realized that I enjoy allowing other people to share this experience." A number of Paynesville people, including his mother Doris, have accompanied Hess on eye-care trips to the Third World. Hess, who has led all but a half dozen of his trips, must communicate with a host country non-government organization, must arrange the travel logistics, and must recruit a team of optometrists and other volunteers for each trip. A typical trip might include eight optometrists and another dozen volunteers who will go and work for five days in some remote corner of the world. They might see 1,000 patients per day while on a trip. Hess likes to focus on getting appropriate glasses to people who need help with their eyesight. Optometrists also check for diseases, but in reality - without consistent medical care - these diseases will quickly recur. Hess figures the groups can have greater impact by focusing on getting more people an appropriate pair of glasses to correct their vision. All the glasses that Hess and his friends give away on these mission trips are donated. They are sorted, cleaned, and marked by volunteers at the Paynesville Area Center, who process about 10,000 pairs of donated eye glasses per year. Unlike Americans, where all lenses are custom made for the patient and where style is a prime consideration when getting new glasses, said Hess, who still has a private optometry practice in Crystal, people in the Third World have to take whatever pair of glasses is closest to their needed correction. 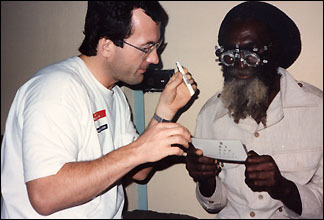 Dr. Jim Hess - shown helping a patient in Jamaica - has taken 35 mission trips through VOSH to five continents, aiding people in need by providing eye care and donated eye glasses. Hess also enjoys his travels with VOSH because it allows him to see the world without strictly being a tourist. On all their trips, they get to see places where tourists don't typically go and get to meet people where they are staying. Hess was born in Lake Henry and attended a two-room schoolhouse in Lake Henry in first and second grade. His family moved to Paynes-ville when he was in third grade. He is still grateful, though, for the opportunities available to him in a small high school. While attending the University of Minnesota, Hess got interested in optometry school and applied to the closest one. His wife - who was a widow with two adults sons - worked with him for many years at the Crystal Vision Clinic. They now live in Maple Grove and have a cabin on Lake Koronis, where they like to fish on weekends. 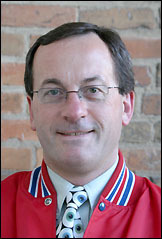 Hess has served as the president of Minnesota VOSH since 1983. He is a past president and current board member of VOSH Interna-tional, a past president of the Crystal Lions Club, and a past president of the Minnesota State Board of Optometry. Among his awards are the Minne-sota Optometric Association Distinguished Service Award (1993), the Melvin Jones Fellowship from Lions International, the Helen Keller Award from the Minnesota Eye Bank, and the Eleven Who Care Award from KARE-11 (2000).